In Naperville, IL the winter usually lasts from the beginning of December till the middle of March. 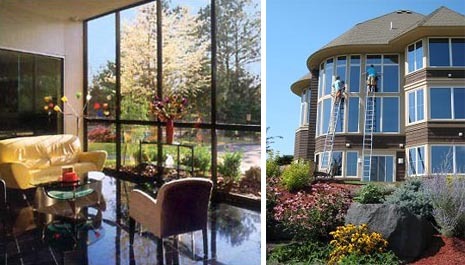 The best time of the year to clean the windows is either the beginning of the spring or late fall. In spring the weather in Naperville is very tricky, so make sure that you chose cloudy day for your job. You do not want to clean windows in the rain, but sunny day is not good either for cleaning windows. In sunny weather the cleaning solution dries up much more quickly and you will finish up with streaky windows. As a professional window washer I will tell you a secret of many window washers: the best window cleaning solution is very easy and you can buy all the ingredients in many local stores in Naperville. For best window cleaning job you need: calm water, dishwasher - joy (citron gives off nice, fresh scent) and vinegar (optional - DO NOT use vinegar if you have tinted windows). dry the edges of the window with cotton cloth. When you finish this procedure following my instructions your windows should be sparkling clean!